Strawberries ~ our first crop of the season is ready! 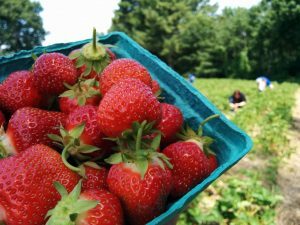 For 31 years, Parlee Farms in Tyngsboro has grown strawberries. It was the first crop we grew and it is the first crop that ripens. When the strawberries are ready for picking, then farm reopens for the season. And that time is now! Here are a few facts about the strawberries that we grow. What are June Bearers (or June-bearing strawberries)? June Bearers are traditional New England varieties of strawberries. These strawberries are available for approximately three weeks starting in mid-June. At Parlee Farms, we have five varieties of June Bearers, with the largest planting being ‘Jewel’ strawberries. A mid-season high quality berry, Jewel strawberries are bright red, flavorful, fragrant, and large which make them easy to pick. All of our June bearing strawberries can be picked by you personally or bought at our farm stand. During the late summer, we do not have pick your own strawberries but don’t fret! You can still buy our freshly picked late summer strawberries at our farm stand. We offer two varieties of these juicy and delicious strawberries. They are available from mid August until early October. How do we plant our strawberries? At Parlee Farms, we begin planting strawberries in mid April. We use raised beds to grow our strawberries. The benefits of using raised beds include good drainage and weeds and grass are kept from impeding on their growth space. To help our new plants grow larger, we pick off all the flowers of the June Bearers in late May during the first year. The fruit will not develop during the first year, but during the second year around mid-May the blossoms will appear on the plants letting us know we are only four weeks away from strawberry season starting (and the farm opening!). So, 15 months after a strawberry plant is planted, we start picking. A planting will last anywhere from 3 – 5 years. At Parlee Farms, we know it’s important to monitor soil health and use the most beneficial nutrients and fertilizers so that we can provide you with the best strawberries possible. Always check TODAY’S FARM NEWS before leaving home. Picking hours change daily based on how many strawberries are ripe for picking, the weather, and the number of people we expect to come picking. The best picking is first thing in the morning. Strawberries are very fragile and the cooler morning temperatures make picking easier and the berries are firmer. Also, the best supply of strawberries is first thing in the morning! Make sure to wear appropriate clothes for visiting a farm. Close-toed shoes, hat and sunscreen are recommended. We welcome families to the farm ~ there is no better way to show children where their food comes from than by picking their own! Strawberry picking is a little more challenging than most fruits because strawberries lay on the ground. So everyone needs to take care in the strawberry patch not to step on the berries. Squished berries are not fun for anyone! Please pay for your strawberries before eating them. While it is very tempting to eat strawberries while picking, please keep in mind that growing fruit is how we make a living. After paying for them, we would be happy to wash them for you so you can enjoy them at our picnic area. Picking strawberries in June is such a great way to start the summer. We hope you will choose Parlee Farms for strawberries this season!